Greek mythology, the Bible, Star Wars, Lord of the Rings and Call of Duty – what do these five things have in common? At the core, they are all tales that either have stood the test of time, or made their creators lots of money or both. But it’s not just the story that makes these things work; it’s engagement – connecting with an audience at the right time in a way that moves them to feel or act a certain way. Engagement is the goal of b-to-b marketers, too, who use content to connect with their audiences and ultimately make the case for their value proposition. But what constitutes rich, engaging content has evolved. 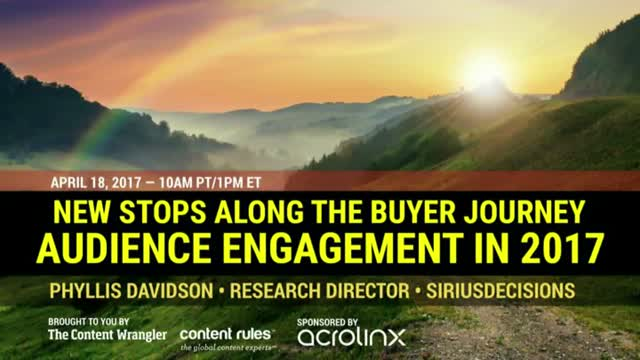 Join me, Scott Abel, The Content Wrangler, and my guest, Phyllis Davidson, Research Director at SiriusDecisions. Davidson will talk about the variables in the B2B audience engagement equation in our digital marketplace. She will help you understand what resonates with customers through the buyer journey—and why. She’ll discuss delivery channels and methods with an emphasis on how the technologies that drive engagement also enrich prospect data. Expect discussion about the latest in interactive content, virtual and augmented reality, artificial intelligence, and more. Phyllis Davidson is an experienced Silicon Valley B2B marketer. She has worked across multiple marketing disciplines in both large and small technology companies as well as at PR and advertising agencies and as a consultant. With storytelling as her core skill, she has built and executed global thought leadership and campaigns programs for both brand building and demand generation, executive and merger and acquisition (M&A) communications, and content strategy and architecture. At SiriusDecisions, Phyllis helps clients with content and communications innovation as well as process and program strategy and development.